Often the question asked is 'who was Arthur?'. Much more rarely asked is the question 'what was Arthur?'. In terms of the 'what', everyone who knows anything about Arthur knows that he was 'King Arthur' - except that he wasn't. A king was a Germanic title, 'se cyning', meaning 'the king', a tribal leader (at first), becoming ever more grand as his territory increased. Romanised Britons didn't have kings. During over three centuries of Roman governance they had fully adopted the Roman system of government. They had judges, or 'magistrates' in their terminology, not kings (at least, in those areas which remained governed by or which still acknowledged the country's central authority). Among these would be a dominant magistrate, one who was acknowledged by most or all as overlord. As a way of examining the well-known list of Arthur's battles below, it would be useful to establish a list of the known Saxon Shore forts. 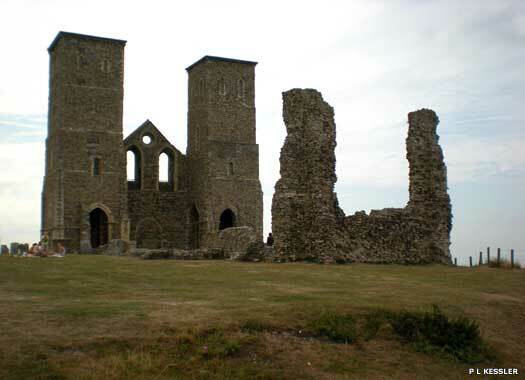 They are Brancaster, Caister-on-Sea, and Burgh Castle (all in Norfolk), Walton Castle (Suffolk, but lost to coastal erosion), Bradwell-on-Sea (Essex), Reculver, Richborough, Dover, and Lympne (all in Kent), Pevensey (East Sussex), and Portchester (Hampshire). As can be seen, the Saxon Shore forts extended from Hampshire in the south to The Wash, and possibly along the north-eastern coast as well. The forts seemed to have been a response to the appearance of seaborne Saxon raiders from the mid-third century, with the defensive line they created apparently being formalised in the fourth century. The list of Arthur's battles points one towards the understanding that at one point he was engaged in defending the coastal areas - the shore. The Roman title for this was 'Comes Litoris Saxonici per Britanniam' (the modern interpretation normally says 'Count of the Saxon Shore for Britain'). With the Roman administration having been removed in AD 409 (by whatever means - see the feature, The End of Roman Britain, for a detailed examination) the Romano-British had to organise their own defences. Early on there would have been infantry on the Roman legion model, supported by cavalry. The Anglo-Saxon Chronicle informs us rather brutally that they were not very good, by boasting about the numbers of Britons dead. By Arthur's time (towards the last decades of the fifth century) these would probably no longer have been used as faux legions, and instead the infantry would have consisted of guards protecting the walls of forts, and guarding persons of importance, such as those who died trying to protect the monks at the Battle of Bangor-Is-Y-Coed in AD 613. 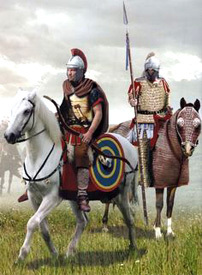 From the available evidence - a few scraps of written material and a good deal of knowledge about the use of fading Roman resources on the Continent - it can be concluded that Arthur would have begun his military career as a cavalry officer of noble birth (in Roman terms, he would have come from an equestrian or patrician family). From there he rose to being responsible for leading a form of rapid response force which would come to the aid of a Saxon Shore fort and its guards (probably all or most of these forts were towers). There have been various estimates of the size of his cavalry force, but around five hundred seems to be the most reasonable figure quoted. Arthur would be under the orders of his magistrate. Early in his career this may not have been the top magistrate. But as success followed success he would have been passed up the chain to fall under the command of the top magistrate, with this individual effectively being a high king in tribal terms, or an emperor in Roman terms. The Roman office of the 'count of the Saxon Shore' is known to have existed by AD 367 when one Nectaridus was killed by barbarians along with a senior dux. While the post may originally have spanned both sides of the Channel, Gaul was later given its own official of this rank. Stilicho's visit to Britain at the end of the fourth century may have resulted in a reorganisation which created a specific comes for the Saxon Shore forts - see AD 367 and 398 of the Britain list for further details. Legend has long claimed that Arthur was born at Tintagel. In the fifth century this lay within the territory of Dumnonia, and is generally accepted even only if a 'better' location cannot be found. However, some spectacular archaeological finds in 2016 have proven that this was indeed a royal capital in the fifth century. It seems now that it is entirely possible that Arthur could have been born here. For a base of operations, though, it is much too far to the west to be any good in fighting Saxons. One long-recognised base of operations is Cadbury Castle (see the Cadbury Castle page for full details). This is based firmly in the West Country, albeit at the eastern edge of it, and could be valid for the phase of the conflict that included the siege of Mount Badon, but wasn't it too far west for the initial operations, those that were being organised by a British central authority in response to the earlier raids, infringements, and settlement of Jutes and Saxons in the south? In Arthur's time the 'emperor' who formed Britain's central authority (or at least the head of a governing council) appears to have been a certain Ambrosius Aurelianus, and Arthur's headquarters would likely have been the fort of Ambrosius. That appears to have been Amesbury (which is easily translated from the modern Anglo-Brythonic name as Ambrose's Fort). This town in Wiltshire sits on a bend in the river which looks like a perfect place to erect a fort. 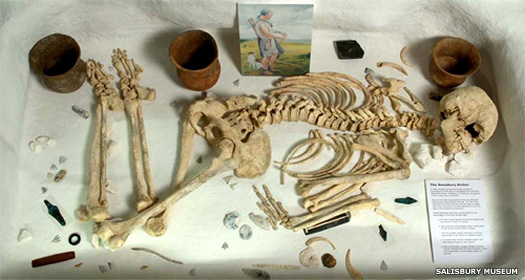 Any Roman remains at Amesbury have been poorly documented, but excavations by Wessex Archaeology have discovered a large Roman graveyard in the area of the Amesbury Archer burial. It does seem likely that a large Romano-British settlement overlooked the River Avon close to Amesbury, at Boscombe Down, immediately to the east. 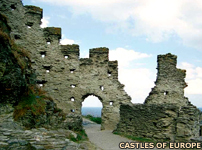 Tintagel had been dismissed as a medieval construction over a seventh or eighth century monastic establishment, but more recent archaeology proved its existence as a major royal centre of the Dumnonian kingdom of south-west Britain precisely at the time in which Arthur may have been born. But prior to AD 500, Saxons had landed more heavily in the east of Britain than they had in the south. A possible forward operating base would have been needed - after all, one does not base hundreds of horsemen at one Saxon Shore tower. That base would need to have been in the east. This means that other proposed centres of operation - Din Eiden and Din Guardi - are also too far away to the north (with apologies to any Scots who wish to claim Arthur as one of theirs). His headquarters would have to be somewhere from which he could ride his attack force either north or south/south-east, covering the east and south coasts. That leaves one intriguing possibility. While the Camelot of legend is generally equated with Cadbury Castle, could 'Camelot' instead be a later contraction of Camulodunum? This was the first Roman capital of Britannia, located in the territory of the Trinovantes tribe (modern Essex). 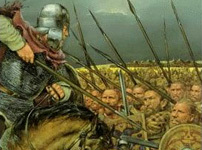 Arthur's cavalry force would have been very mobile, and Camulodunum would have been merely one of many strongholds his troop would have used, but it would certainly make sense to use it. Camulodunum is perfectly placed to serve as a headquarters for a British defensive force. All this organisation is wonderful, and the Romano-British seemed to be prepared for anything (on parchment, at least, and subsequent to the early fifth century social collapse), but just where were the enemy? From the middle of the fifth century Saxon migration into southern Britain became heavy. They may often have used areas of recently-conquered Kent as a bridgehead for further advances along the Thames Estuary, which they used as a thoroughfare to possess land as far west as Berkshire. In the east, Angles were heavily infiltrating the coast as far north as The Wash and Lincolnshire, again using rivers to make their advances. Curiously, Saxon infiltration into Essex seems to have been minimal until the early decades of the sixth century. 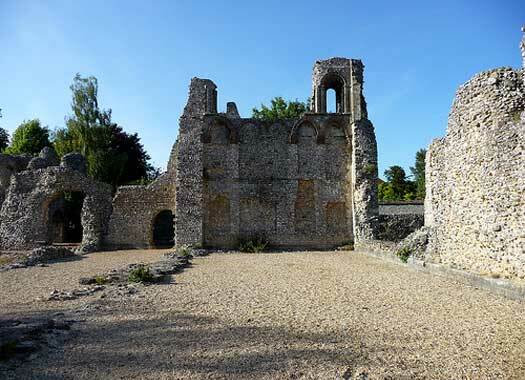 Archaeology has shown a clear lack of Saxon relics until the mid-500s. Very little fighting also seems to take place around here, suggesting that a peaceful arrangement has been reached, or that the British administration at Camulodunum is well able to protect its immediate territory. Given those dispositions, would a base at Camulodunum be feasible? Would it be too close to the enemy, or would it operate more like a forward operating base of the sort seen in more recent operations in Afghanistan? Well, the archaeological evidence, along with the little written information available all seems to say yes, a forward base was not only possible, it was likely. That gives us the chain of command, the centre of operations, and the enemy. So what do we know of the battles? Claims that the 'm' in Camelodunum would have become a 'v' (spelled using an 'f' in Welsh) can be dismissed. It is quite accurate to state that someone who could read would see 'Camel' in print, but pronounce it 'Cavel' because that pronunciation had long before changed from 'm' to 'v'. Then the vowel was dropped, producing a shift along the lines of Camelodun to Cavelodun to Coldun or Caer Col and then to Colchester or something similar. However, in support of Camulodunum being altered more directly into Camelot, this deity name, Camulos, survived with its 'm' intact elsewhere, such as in the River Camel (Kammel) in Cornwall, the River Cam in Somerset, and likely the River Cam in Gloucestershire. The list of Arthur's battles is very telling. Keep in mind that in southern Britain the customs on leadership were Roman, not tribal. A tribal leader, a king, is both battle leader and magistrate. A Roman magistrate on the other hand sends out military commanders to do the actual fighting. If indeed it was Ambrosius Aurelianus who was Arthur's commander, then he would have stayed home while a dux or comes (equivalent to a Roman consul in terms of his duties) went out with the troops. 1. At the mouth of the River Glein. The location of this river is unknown, but this would be a river mouth (obviously), close to the seashore. That would certainly be something that would concern a count of the Saxon Shore. 2-5. Battles at the Dubglas in Linnuis. Linnuis is Lindsay (modern Lincolnshire), which was soon to become the territory of the Lindisware. One of the places at which Saxons (or Angles) landed may have been The Haven, below Boston, which is navigable. This would definitely be an area that would be defended by the comes who was in charge of the 'Shore' forts. That's three more battles in favour of the count of the Saxon Shore. 6. A battle at the Bassas. The location is uncertain but most likely it was near Glasgow. This is not a Saxon Shore locale and is unlikely even to involve Saxons. The most likely cause is Irish raiders or the first wave of Irish settlers of the Dal Riata territory in western Pictland. 7. A battle in the Caledonian Forest (Cat Coit Celedon). This would have to be against Picts (or perhaps against an Irish raiding force that had managed to move inland). Again this is not a Saxon Shore locale, but interestingly enough it follows on after No 6. Was the battle on the Bassas inconclusive? 8. A battle at the fort of Guinnion (Venta Belgarum, or Caer Guinnion in later British records - see the page covering Caer Gwinntguic for fuller details). The fort is generally seen as an older version of today's Winchester. One source says that 'an intermediate stage in the evolution of Winchester's name was the Romano-British Caer Guinntguic or Caer Guinn. The suffix "-guic" would be a corrupt form of "-iog", a standard Celtic place-name ending'. If invading Saxons had managed to penetrate that far inland it would be a shocking occurrence, although it could instead have been a revolt by Germanic laeti who were already settled in the region. In any case, it would be within the reach of a count of the Saxon Shore. 9. A battle at a fort of the legion. This 'fort of the legion' is usually agreed either to be Chester or Caerleon in the west, either near or in what is now Wales. There is a faint possibility that it was one of Arthur's battles but the location means that it would have been against Irish forces. 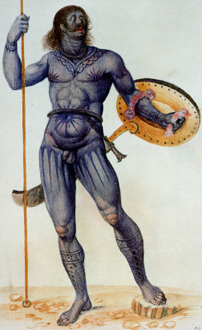 Alternatively, could there have been another popularly-known Caer Legion? Might York (Caer Ebrauc) have been known casually in this way? Probably not, but if York was indeed the site then it may or may not have fallen within the area of responsibility of the count of the Saxon Shore. Mitigating against this is the north being perceived to have maintained itself as a Roman militarised zone, not a civilian one, with the Romano-Britons maintaining this arrangement well into the middle of the sixth century (see the page covering Ebrauc for full details). The involvement of the Saxon Shore's count here is a bit of a toss-up. If it's the west then it's unlikely. If it's York then it would have to be serious to warrant Saxon Shore involvement in the militarised zone. Being more practical, perhaps this is simply the great battle of AD 613 added here by later scribes to inflate Arthur's reputation. 10. A battle at the River Tribruit. Is this an older name of the Trent? There's no certainty of that, but in any case a battle along a river indicates the involvement of the Saxon Shore's defensive forces (Saxons were like Vikings in that they sailed up rivers). Score another for the count here. 11. A battle at Agned Hill. Geoffrey of Monmouth says that this was located in Edinburgh (within the territory of the Guotodin - see their page), but he is notoriously unreliable! Better to ignore this one as having been lumped in with the others to provide a nice round number of battles. 12. The battle of Badon Hill. This one seems to represent Saxons attempting to circle around the Saxon Shore defences. The best theory behind it is that it is led by the South Saxon king, Aella, who used his grand status as bretwalda to organise the other Saxon elements in southern Britain to launch a full scale attack (see c.496 in the Suth Seaxe list for full details). As an inland campaign this would have been outside the count's direct area of responsibility but the seriousness of the situation could draw in all available defenders. This is especially pertinent given that early fifth century Britain seems to have been woefully short of them. The situation appears to have improved by the middle of the century, but Badon seems to have been a remarkable attempt by the Saxons to crush the organised resistance, and its aftermath was so devastating that it resulted in a generation of Saxon peace. As can be seen from that list, the score is seven in favour of the count of the Saxon Shore, three against involvement, and two that cannot be decided either way. One thing that has to be considered is whether the twelve battles were given in chronological order. If they were then it strengthens the progress of Arthur's career that has been postulated here. It makes sense of the idea that he began his career defending the east and south shores, and was so successful that attacks by Saxons tried to go around the defences. The list of battles could also suggest that, after the Saxon settlements or military advances were destroyed, Arthur turned his attention to the Picts and to Irish raiders, with a larger assigned area of responsibility. So much for promotion, although Arthur's involvement in the north seems unlikely in any realistic examination. It can be postulated that Arthur began his service as a high level officer by being appointed as the count of the Saxon Shore forts. Then he was promoted to the rank of dux at some point. Then, upon the death of the imperator (or the high king as the more tribal Britons of the west would have referred to him), he succeeded as emperor of the Britons. As dux his area of responsibility would have expanded to cover all of Britannia, where his cavalry force of five hundred would have come to the aid of local magistrates in the south or east, or chieftains in the less heavily-Romanised west. Pretty much at the top of the military ladder by now (probably equal in rank at least to the commander of the militarised north), Arthur probably succeeded his own commanding officer - the country's imperator - upon the latter's death. So a good approximation of the course of his career would be from count of the Saxon Shore to dux Brittanorum to emperor of Britannia. What was Arthur? He was one of Britain's most important leaders of the late fifth and early sixth centuries, that's what. Text copyright © Edward Dawson and P L Kessler. An original feature for the History Files.